Bacon makes everything better and this recipe is proof! 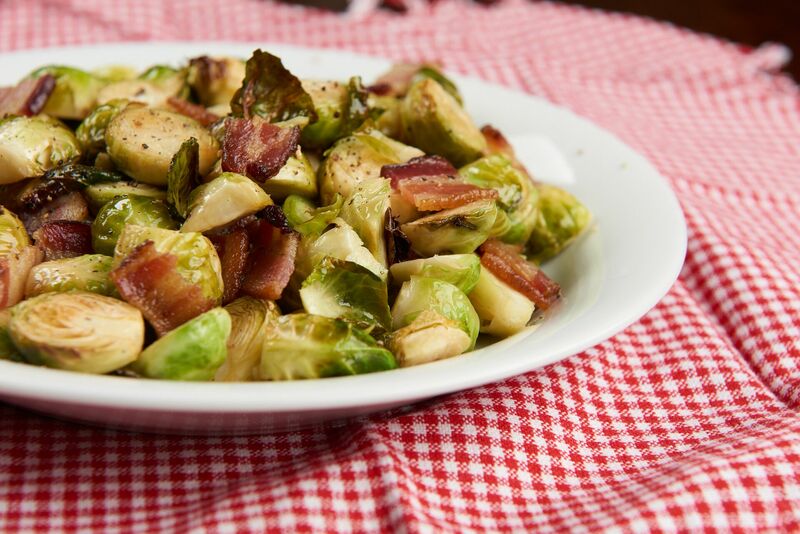 Delicious, tender brussels sprouts are a delicious compliment to our thick, juicy bacon. Preheat oven to 400 degrees. Carefully trim off the ends of the brussels sprouts and remove any loose or old leaves. Slice the Brussels sprouts in half lengthwise. In a mixing bowl, mix Brussels sprouts with butter salt and pepper. On a foil-lined sheet pan, spread Brussels sprouts mixture in an even layer. Sprinkle bacon amongst the bacon mixture. Place pan in the oven and bake for approximately 30 minutes, stirring the Brussels sprouts approximately every 10 minutes. Remove pan from oven when bacon is crisp and Brussels sprouts are slightly toasted on their edges. Sprinkle with salt and drizzle balsamic vinegar over sprouts.